franklin’s erebus and what lies below: any hockey sticks? The ice is in. The Great Northern Rink that is Canada’s Arctic Ocean may be ever more in peril in these melting times of ours, but it can still fill the imagination of those of us down here in the temperate south of the country with notions of endless ice just waiting for us to show up with our gear. We’ll never skate Baffin Bay or the Northwest Passage; we know that. Doesn’t mean we don’t love the idea that ice-time awaits if we could just get up there. We wouldn’t need much. Sitting on our coats on the shore at Terror Bay, one socken foot in the air, loosening the laces of our Tacks. Hold on a sec, we’re coming. Get us out there on the glassy ice of Simpson Strait, pass us the puck, and we’d be on a breakaway to the Beaufort Sea. 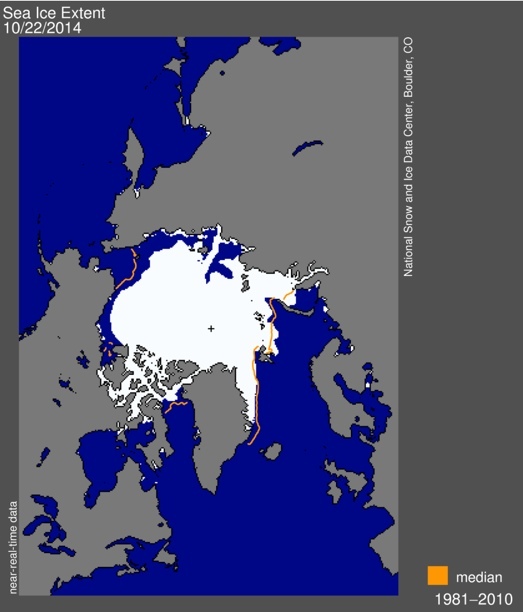 State of the Rink: The spread of Arctic ice, as of October 22, 2014, from the National Snow and Ice Centre in Boulder, Colorado. The only time I was up that way it was August, cold enough but unfrozen. We didn’t have our stuff, anyway, no sticks, no skates: that’s not what we were there for. This was a few years ago now, on King William Island in Nunavut, where Sir John Franklin and his crew ended up in the 1840s, abandoning their ships (we think) in Victoria Strait before trying to walk south and, well — dying on the way. We were five of us on our modest adventure, moving mostly on foot, a bit in a small open boat with an outboard. Tracing some of the territory Franklin covered, we talked a lot about where his ships might be, especially after we met Louie Kamookak, the Franklin historian who lives in Gjoa Haven, the only settlement on King William. He had lots of stories about the land and the people and some good Franklin-search tales, too. He smiled at us when we asked him if he knew where the ships were. I think he had a pretty good idea — he’d been studying the problem for years — though the smile was as much as he divulged to us. He took us in his boat to see some Franklin sites near Gjoa Haven, graves on an island, a skull sitting out in the weather. We needed a ride to Douglas Bay and he was glad to take us the next day. It was a gorgeous morning on the Simpson Strait, gleaming sun and sky and water, Canadian mainland on the left, the whole flat Arctic distance mapped out to the right. I remember thinking about being in geography and history both at the same moment, fooling around with that idea in my head as we motored along, as I checked, one more time, to see if I could see any lifejackets anywhere in Louie’s boat. 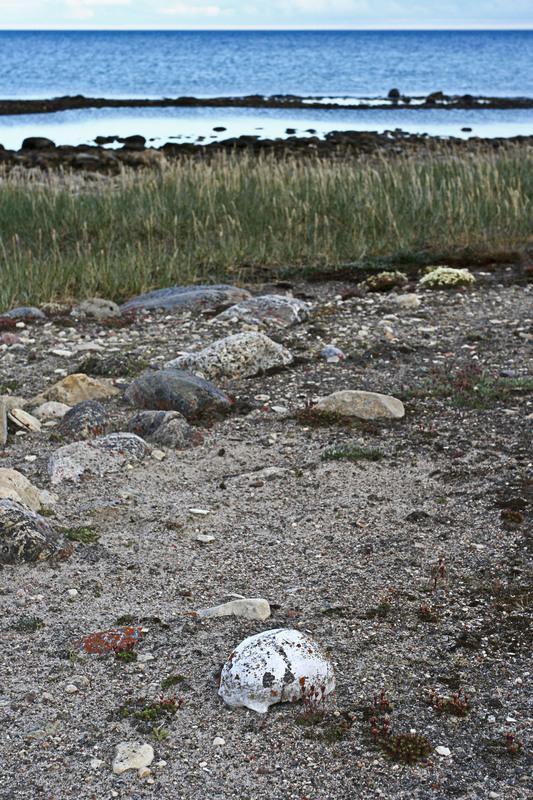 Remnant: A skull lies unearthed in Nunavut, along the route that Franklin’s doomed men followed south from King William Island in the late 1840s. No. None. I didn’t think asking about this was going to help my anxiety but still, I asked. Louie had a drip-coffeemaker aboard that he’d plugged into a generator when we’d beached on the island so that the coffee was brewed by the time we got back from seeing the skull. I liked that; that was smart. But no lifejackets, Louie? He was already smiling his smile that he smiled when I started to ask. I don’t want to die, he said, in a hospital. Louie has been working with the Parks Canada archeologists who’ve been searching for Franklin’s lost ships over the past several summers and he was happy, he e-mailed this September, when they found one of them. We hadn’t been all that far away, as it turns out, from the wreck that was soon determined to be H.M.S Erebus, Franklin’s flagship. Far to the south, a few of us who’d been up there drinking coffee without lifejackets went to our maps, of course. So close: we’d turned back a mere 80 kilometres + 12 metres of ocean + tons of expert know-how + political resolve + millions dollars of sophisticated marine hardware from finding the wreck for ourselves. I was as excited as anyone when the news broke. I studied the coppery-coloured sonar images as though I just had to stare and wait for the story of the expedition’s lost years to upload. I got out my Frozen In Time, my Schwatka’s Last Search. I tuned into the press conferences, watched the Prime Minister’s excitement beaming out from Ottawa. I waited for the archeologists to get back up north to dive the wreck. I was thrilled, when they did, to watch them swim cameras past kindlinged decks and corpses of cannon. I was sorry that the divers and the cameras couldn’t stay longer. But the season for swimming in the Arctic was over. The ocean was getting ready to lock itself up for the winter. Is Franklin’s body aboard Erebus? That’s a big question. If you’ve read David Woodman’s Unravelling The Franklin Mystery: Inuit Testimony (1991) you’ll be familiar with Inuit accounts of 19th-century hunters climbing aboard an abandoned kabloona ship somewhere off King William Island and seeing the body of a tall man belowdecks. Reports from September’s dive seem to indicate that some Erebus cabins are more or less intact so maybe … But I don’t know. Louie thought that Franklin’s tomb is on King William, up somewhere near Victory Point, and that sounds like sense to me. The archeologists had just 12 hours underwater in September. No surprise, then, that they can’t wait to get back down to the wreck. The latest word is that they’re thinking of trying it in the spring, through the ice. In the meantime, we have our questions to get us through the winter months. And these, of course, include the fundamental one that has to be asked every time anyone has the chance to explore a major historical shipwreck: any hockey sticks aboard the ship in question and, if so, how many? Any skates? If Titanic carried a hockey cargo (which it maybe did), what about Erebus and (the yet unfound) Terror? Probably not. But possibly so. We endeavour to keep ourselves in good humour, health, and spirits by an agreeable variety of useful occupation and amusement. Till the snow fell the game of hockey played on the ice was the morning’s sport. Was hockey a want or a comfort? Maybe it wasn’t on Franklin’s mind as he fitted his ships at Greenhithe. But what about his crew? At first pass, it seems more likely that any sporting the crews did in the Arctic would have been with cricket bats or footballs. The officers were English, Scots, and Irish and, as Scott Cookman tells us in Iceblink, the 110-man crew included 99 Englishmen, 7 Scots, 3 Welshmen along with a single Canadian, from Nova Scotia. Why don’t we know more about him? After a concentrated search of Franklin resources (both onshelf and online), I still can’t put a name to him, let alone discover whether he was an old naval hand, veteran of many voyages, or one of the new recruits, or first-entries, for whom this first foray was also the last. Call him Thomas Tadman. That’s a name picked at random from the Muster Books, just for convenience. There is supposed to have been shinny in Nova Scotia in the early 19th-century, maybe, so it’s possible that our lone Maritimer had played back home with a passion that he carried with him as he pursued his career with the Royal Navy, lugging skates and sticks with him wherever he travelled, as Canadians are known to do, to the death. Problems with this scenario include: lack of proof; awkwardness of carrying hockey sticks everywhere you go; futility/frustration of being the only guy on the expedition with his stuff + resulting ridicule; no-one to play with. 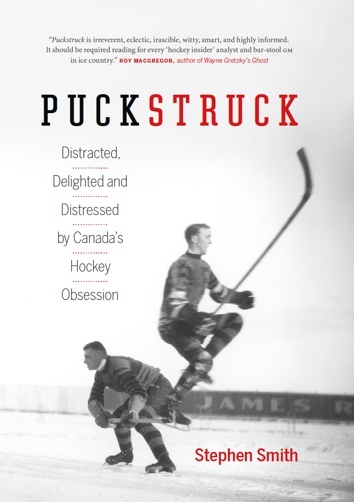 A Tadman narrative assumes, too, as we now know not to, that hockey is a Canadian original. We’ve never liked the idea that the game might be foreign-born, which is why we’ve mostly done our best to ignore the evidence. That’s been harder since the spring, when Society for International Hockey Research historians Carl Giden, Patrick Houda and Jean-Patrice Martel published their book On The Origin Of Hockey which makes the case, in volume and detail, that Canada is at best a loving foster-home: if hockey has a birthplace, it’s England. So maybe it wasn’t just Thomas Tadman with a stick. On The Origin of Hockey cites several accounts of hockey from Lincolnshire and Norfolk in the 1830s. Could be that the whole crew was hockey-savvy, always had been, Henry Peglar and William Orren and John Diggle, to name at random a few other crewman who might as well have born in Flin Flon or Renfrew or Delisle for their devotion to the game. 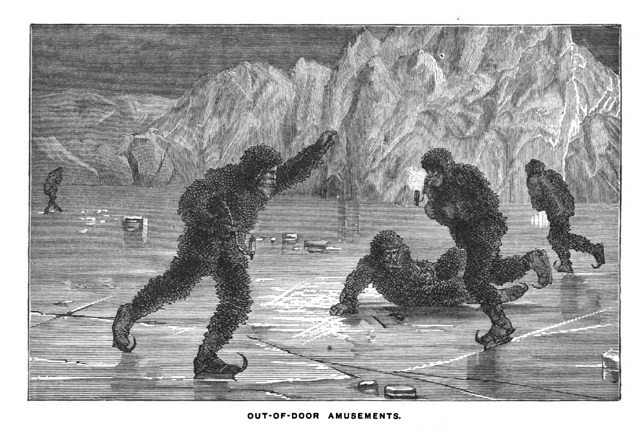 In which case there could have been lots of crewmen kitted out with sticks and skates, getting out overboard every chance they got while Terror and Erebus were beset in the ice off King William, waiting for the freedom to sail away that would never come. Rink Trouble: H.M.S. 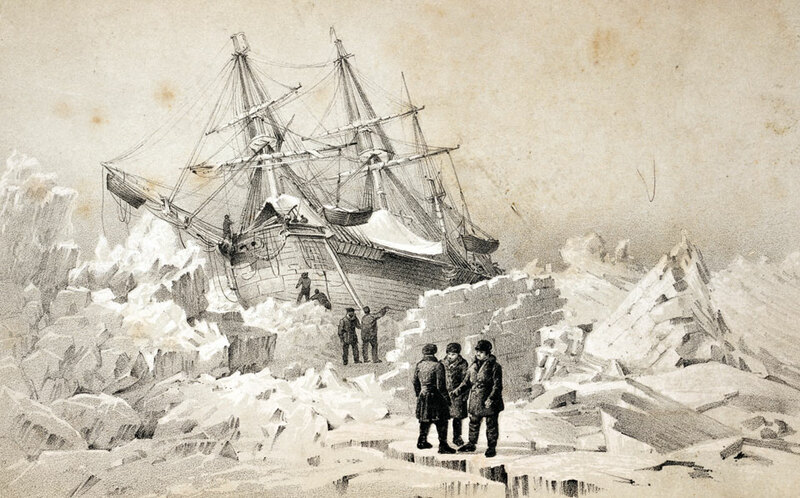 Terror beset in Arctic ice on a pre-Franklin voyage in 1838. Of course the winters would have been dark. Months of gloom might have put a damper on the hockey. I guess they could have worked up some kind of torch-lighting, out on the ice. Which, of course, is another matter: there’s no guarantee that the ocean west of King William froze flat. Who knows what kind of topography they were looking at over the side of those ships, let alone what kind of shovels they might have had at hand to clear themselves a rink, or whether they would have bothered. I’m assuming, of course, that they would have had plenty of prospective pucks. The bung from one of the raisin or suet casks would have served nicely, or one of Goldner’s poisonous pint-tins cut down to size. It’s not so implausible. Perched up a stepladder recently in an antiquarian bookstore, I came across the engraving at the top that you saw when you got here. 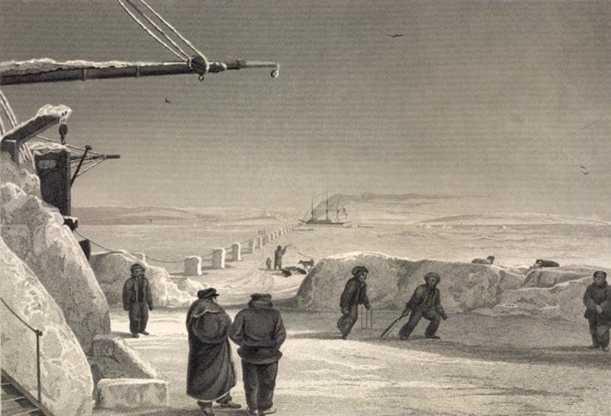 It’s from account of the Second German North Polar Expedition from 1869. That’s not one I knew about. I guess once the Germans decided it was time they got in on the business of sailing ships to the icy top of the world, they reinforced the hulls of a couple of schooners, Germania and Hansa, and sent them up the east coast of Greenland. They weren’t searching for a route across the Arctic, or looking for Franklin. They did have an impressive cargo of naturalists, astronomers, and geologists aboard. I’m not saying theirs wasn’t a fascinatingly perilous voyage of significant scientific value, just that I’m not going to get into that here: what’s important, obviously, is the image with which we started. The fact that it doesn’t show an outright hockey game is disappointing. Is there solace in those outfits the men are wearing? Some. And who knows: isn’t it possible that having just finished up an hour’s hearty scrimmage, the men depicted planted their sticks in a snowbank just out of frame? Is that such a stretch? Fast bound in the irresistible ice, the Hansa was doomed to remain until spring. The crew, meanwhile, did what they could to cheer the monotony of their daily lives, indulging in all kinds of gymnastic exercises, and skating on the frozen surface of the sea. Captain Hegemann, afraid that his vessel might not be able to withstand the increasing pressure of the ice, began to consider the best mode of encountering the bitter experiences of a Polar winter. If the weather was suitable, astronomical observations and calculations were made and registered. At noon all hands were summoned to dinner, at which a good rich soup formed the chief dish: there was no lack of variety, as the stock of preserved vegetables was large. Alcoholic liquors were dealt out very sparingly; but on Sunday each person received a glass of port. The out-of-door amusements consisted mainly of skating, and building up huge images of snow. Of course it’s strange for us to think of people skaters not playing hockey, but these were Germans, remember. Us Canadians, them English, we’re made differently: we’ll use paddles if we have to, spars and boathooks. There will be hockey. Me, I won’t be surprised if there’s no tall man to be found aboard Erebus, nor if the ship’s discovery yields no sticks or skate-blades. If that’s what they find — don’t find — I’m ready. And even if there was hockey gear aboard in the first place, I don’t know that there’s much we’d be able to learn from it now. What story can a stick tell of the hockey it’s known? A few photographs, on the other hand, of the big Christmas Day shinny challenge of 1846 — that would be something. Or I guess maybe glass-plate negatives is what they’d have to be. 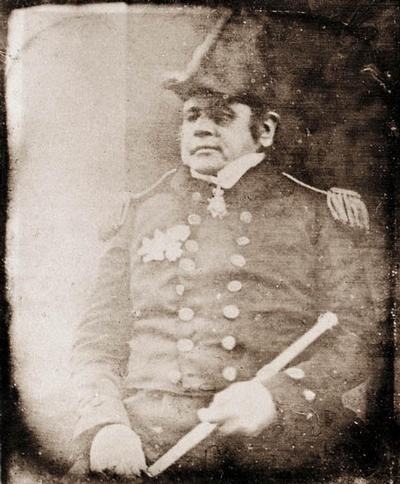 Because of course Franklin’s expedition had a camera, provided by the photographer from the Illustrated London News who took the famous portrait of a fluey Sir John in April of 1845, four months before he and his hockey players set sail for the north. Overexposure: A flu-ridden Franklin sits for a photograph in April of 1845.